DOUG COBY BREAKS 2017 SPELL WINNING THE SEEKONK "150"
The NASCAR Whelen Modified Tour (NWMT) came to the quick oval of Seekonk Speedway for 150 laps of fast short track racing. The circuits clicked off fast with on track moves just as fast. Doug Coby of Milford, CT came to Seekonk winless so far in 2017 in NWMT events. He finally made his mark by leading the most laps, surviving seven cautions, several restarts and red flags to cross the finish line first. With three circuits to go the green flag flew and Coby was able to hold off Ryan Preece of Berlin, Ct and Anthony Nocella of Woburn, MA to pull off his first 2017 victory. 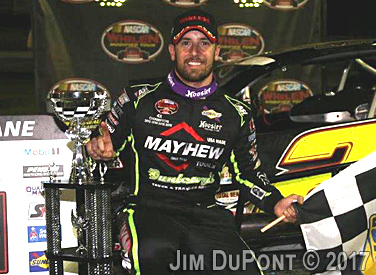 It has been a challenging year for Coby and the #2 Mayhew Tools/Dunleavy/AJ Romano Construction team who have with stood a lot of bad luck and unexpected finishers. To finally break through and complete a great run was an achievement the #2 team has been waiting to accomplish. Leading over one-half of the race shows the #2 team and their driver is ready to go forward and make their track presence known again. Nocella had only run with the tour drivers once before but with his home track advantage he gave it his all to test the NWMT teams skills. Starting mid-pack Nocella avoided incidents, ran a steady pace and broke into the top five on Lap 100. From there he made his presence know as he threatened the leaders for position. He was adept on the track and with two to go had second and made Coby work hard for the win. Preece had a good car, timed well and stayed within the top five group for all 150 laps. He started on the outside pole, led for one lap, but did not have enough at the end to force his way under Coby for position. Matt Swanson finished fourth followed by Dave Sapienza for fifth. Justin Bonsignore, Matt Hirschman, Max Zachem, Gary McDonald and Wade Cole rounded up the top ten finishers. 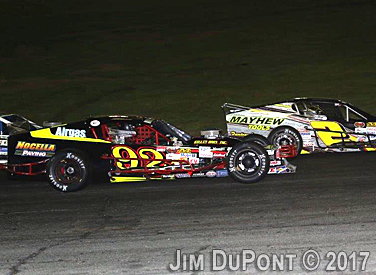 Teams will regroup and prepare for racing next Saturday at Oswego Speedway in New York. What are your thoughts on racing at Seekonk Speedway? Heading to Oswego where you won last year your thoughts?